Tessa and I first visited the Nurburgring at the end of our big European Tour in 2001, where it was our first track experience with the car. Right from our first piece of red and white kerbing we were hooked. 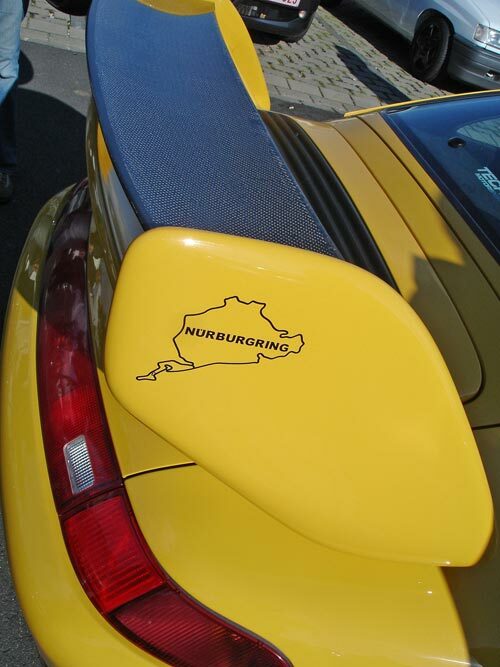 The 'Nordschleife' - literally 'North Curve' - is a 13 mile loop through the Eifel region in Germany. 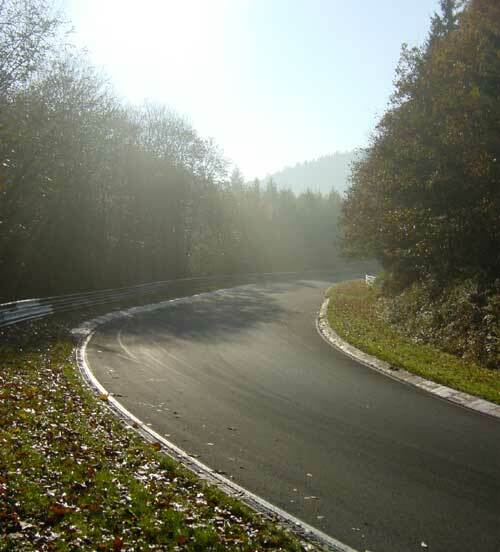 It was purpose built from 1925-27 as part of a larger circuit which also incorporated the Sudschleife (South Curve) and a start/finish loop. The full circuit was about 18 miles long. 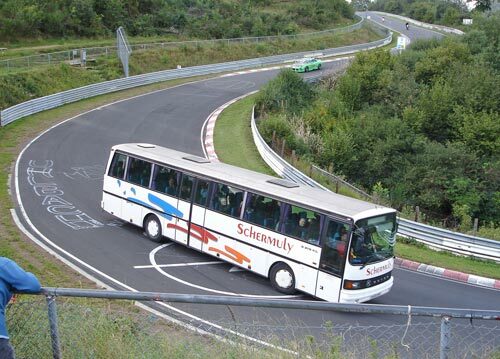 Now the Sudschleife has all but disappeared and the start/finish loop has been incorporated into the modern Grand Prix Nurburgring circuit. 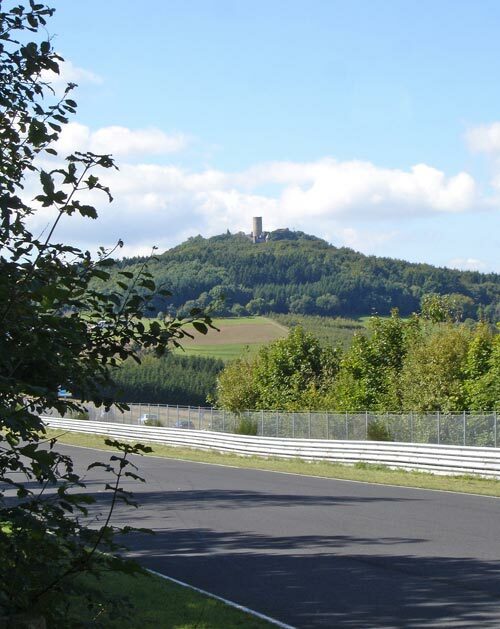 But the Nordschleife remains pretty much as it was back then, which means that you can drive the same circuit where legends like Nuvolari, Carraciola, Fangio, Moss and Stewart drove during the German Grand Prix - up to the GP of 1976, when Niki Lauda was seriously injured there. Busy October '05 Public Day. 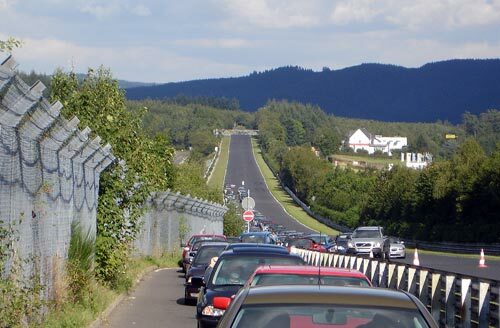 Although there are track days on the Nordschleife the easiest way to drive the track is on a public day, when the track effectively becomes a one way, de-restricted toll road. For about £10 you can drive any road legal vehicle around the track, at whatever speed you wish. Don't be surprised to find camper vans, even coaches, trundling around on these days, amongst the bikers and frighteningly fast locals in their 'Ring spec cars. Anything can go on track during Public Days - beware slower vehicles! There is no doubt that the daunting track takes no prisoners. There is little or no run off and Armco surrounds the whole track on each side. On summer public days the track can seem crowded and even more dangerous, with huge speed differentials between vehicles on the circuit, but treated with respect, and driven within ones limits you will not find a more satisfying and fabulous piece of track. Always plenty of Porsches at the Ring, and they can be very effective! This section of our website is intended to encourage you to visit and drive on the track. It really is pretty close and can be visited for a long weekend. Once you are there of course the thing to do is drive on the circuit, but hopefully here you will see that there is much more to the area, and it is more deserving of a longer stay than most people manage. 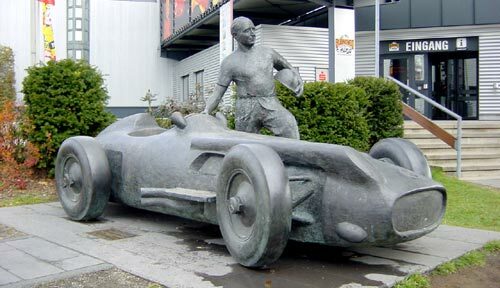 Many people who go there stay in the village of Nurburg itself, within 1 mile of the track entrance, arrive the night before, drive all day and then leave without exploring a little further. Do this and you will still have a fabulous trip believe me, but we have had the luxury of being able to spend a few days there and so have been able to explore the track and surrounding area in a little more depth. Whilst it is petrol-head heaven, it is also an area that - dare I say - partners who may not have such a track based interest will still enjoy. The setting in the mountains is beautiful, with forest walks and bike trails. We have enjoyed fabulous local food, and wine comes from the Mossel and Rhine regions which are nearby. The history that surrounds this place makes it even more special, and walking or driving around the track you cannot help but admire the drivers of era's gone by who drove unbelievable machines at unimaginable speeds around the same track. Most of the following pictures were taken in October 2003, when Tessa and I spent 4 days staying in Adenau, one of the 'Rings surrounding villages. We completed 25 laps in 1 and half days of public sessions, and then spent the next day cycling around the track perimeter with mountain bikes that we had hired from the hotel (details in a later section) This gave us a fabulous close up view of the track from every corner, and we were able to take pictures and see views that you certainly do not see when driving around in a car. Looking up the track from Berwerk on a beautiful October morning. The following sections are in order, completing a whole lap of the circuit, and include track details as well as the surrounding countryside. Not meant as a track guide as such, but it could be useful if you intend to drive the track. If you have already driven the track then hopefully they will show you some new angles on the circuit.